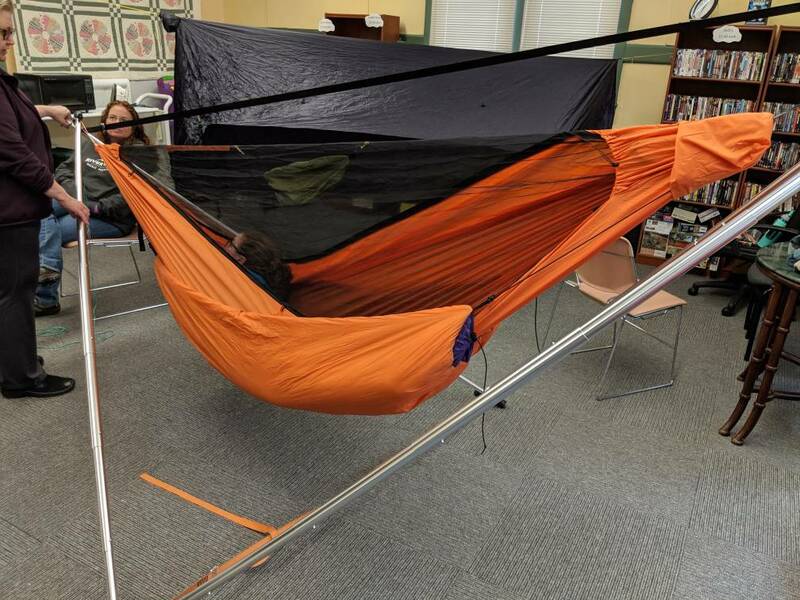 Thread: Hammock demo at our library! 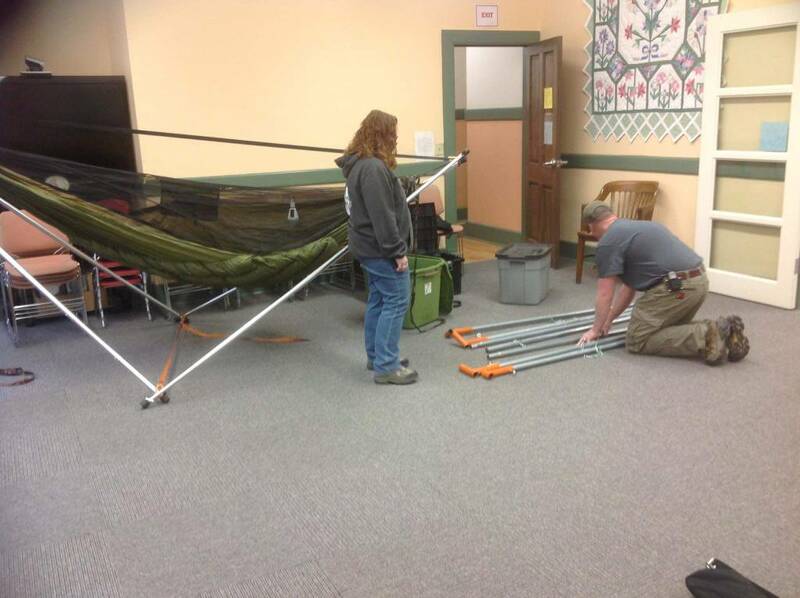 So Saturday we did a camping hammock demo at our library. We did it inside due to mud, it's Maine after all, and it went great. We had a few serious folks interested in the gear and people learned a lot. 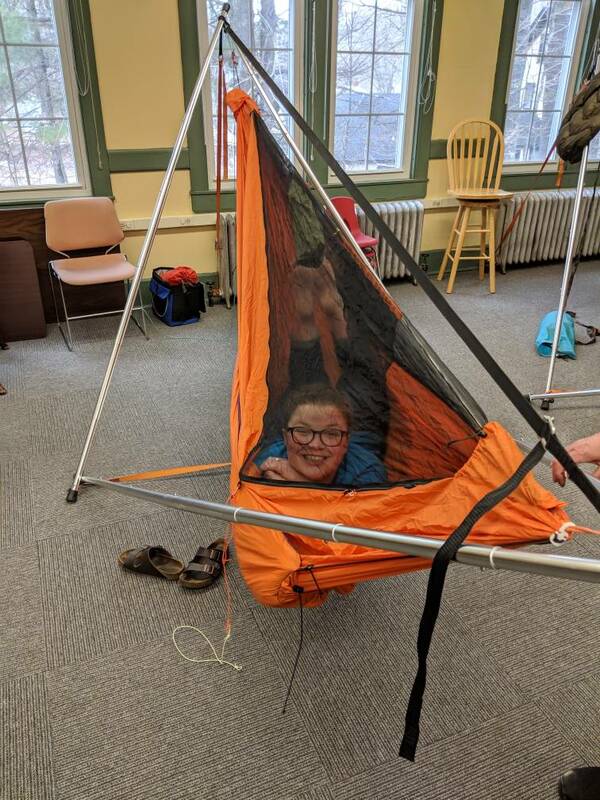 We also had a mom and four little girls come in and we let the girls try out the hammocks. They loved it! Pictures below of the event that I took. I spend more time making stuff than I do using it all! Oh, our fearless leader of the hammock forums himself ATtroll showed up and helped! He brought the bridge hammock. Excellent! Thanks for taking the time to do such a worthwhile event. Couldn't have done it without those Tensa stands!!! Outstanding, and love the photos. I need to show these to my wife (she's involved in 4-H and it might give some ideas). Always good when libraries and such help educate people about something they may not have considered before. Was the stand for the bridge hammock DIY? How long was the span? If DIY, what are the pieces called that connect the center pole to the legs? I've looked for them at Home Depot and the several people I asked didn't couldn't find them. Thank you. In order to see what few have seen, you must go where few have gone. And DO what few have done. 13' and ask ATtroll as he built it! Wow those are some nice hammock kits you've got there. Thank you for helping to spread the word on how to properly use a hammock.